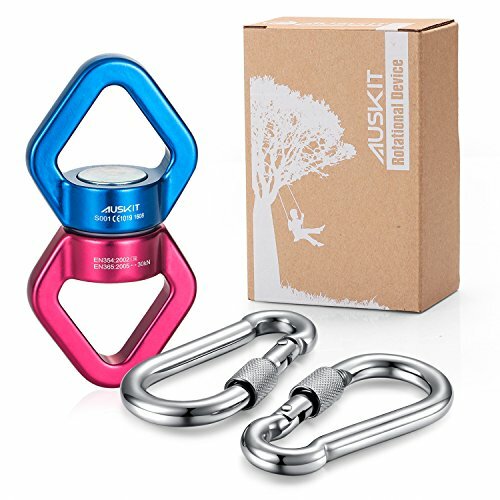 This Straight Gate Carabiner set with is Perfect suspension for the harsh demands of rock climbing and mountaineering, are popular for hanging swings, chairs, hammocks, aerial silks,swings to dance and acrobatics. AusKit King devotes to offer better and better Swing Spinner set to provide you with quality, comfort and safety so you can enjoy Family time peacefully. 1.Wide eye openings can accommodate multiple carabiners. 2.Made from hot forged with large bearings and heat treated, stainless steel axles. 3.Super Tire Swings, Disc Swings, Web Swings, Chair Swings or Hammock Swings..Use indoors or outdoors. 4.This Safety Rotational Device clips can be used with any hanging swing. Working load: 1000 lbs. 30kN Tested. 5.Placed between a load and either rope or cable, the twister avoids severe rope twisting while the load turns. 6.Rotation is an important part of many therapy activities, our safety rotational device features a solid aluminum body with smooth roller bearings for free rotation. 7.This Heavy-Duty Swing is the Ideal Way To Upgrade Your Swing by Turning It Into a Super-Smooth Spinning Machine. Kids Absolutely Love Its! What are you waiting for? Click "Add to Cart" button and buy one more for your friends and family. HIGHEST QUALITY SWIVES:Totally Silent, Frictionless 360°Free Rotation with Sealed Ball Bearings,Very Compact and Symmetrical Swivel. INDUSTRIAL-GRADE SWIVEL DESIGNED: Aluminum Magnesium Alloy, Strong and Durable.30kN (1000 lbs.) Breaking Strength Tested, 2,000lbs.Recommended Working Load Limit. POPULAR FOR ALL KINDS OF RIGGING AND HANGING:Use with Hanging Swings, Chairs, Hammocks, Aerial Silks, Hammock Pod Kids Swing,Outdoor and Indoor Children's Hammock Chair Nook, Net Spider Web Round Swing,Outdoor Swing N' Spin,Tree Swing Strap, Saucer Spinner Tree Swing, Swing Strap, or Anywhere You Need Dependable, Smooth Rotation Without Twisting Chains or Ropes. FREE GIFT:Snap Hook Set Of Two.Opens and closes smoothly as the spring- loaded gate makes it easy to attach important items to it.Allow quick connect/dis-connect of ropes, chains and straps.Great Children's Birthday Gift. If you have any questions about this product by AusKit, contact us by completing and submitting the form below. If you are looking for a specif part number, please include it with your message.